Meet the New Dogfish, Same as the Old Dogfish – Ya Like Dags? Recently Will over at Bomai Cruz posed the question, “what determines a species?” This is a relevant question for spiny dogfish research, since much of what is currently known about Squalus acanthias comes from work on the very well-studied north Pacific population. However, dogfish in the north Pacific have dramatically different life history characteristics from dogfish anywhere else in the world, with a later age at maturity (29-35 years for north Pacific females, 10-16 years for Atlantic females), and larger maximum size (122-130 cm for the north Pacific population, 110-117 cm for everyone else). Now, using genetic data from several different spiny dogfish populations, a new paper may have uncovered information that could set everything we know about spiny dogfish as a species on its head. As a knuckle-dragging ecologist who is far more comfortable counting shark puke than putting together gene sequences, I tend to view genetic methods as a strange and esoteric combination of complex mathematics and witchcraft. Geneticists sit down in front of a computer and perform methods that I barely understand, and come up with results that shake up the whole understanding of the species. Because I’m probably the last person you’d want explaining anything but the very basics of genetic analysis, I’ll just skim over the methods section of this paper and write about the results (for those who are more genetically inclined, the link for the paper is provided in the citation and I’d love to see your insight in the comments). And oh, what results they are. From Verissimo et al. (2010). Basically the authors of this paper looked at the principal component analysis (PCA) of allelic frequencies (eight different loci). What this means in English (if I’m translating it right) is that the researchers looked at allelic differences between these populations and based on this were able to group the world’s spiny dogfish into two main groups: those from areas above the equator in the Pacific (the group to the right: JA = Japan, CA = California, WAOR = Washington/Oregon) and those occupying waters pretty much everywhere else, from below the equator in the Pacific (CHI = Chile, NZ = New Zealand) to all over the Atlantic (MA = Massachusetts, UK = England, IRE = Ireland, VA = Virginia, ARG = Argentina). This means that the north Pacific dogfish population is genetically distinct from the rest of what we know as spiny dogfish, and that there is very little mixing going on through the equator in the Pacific. So what does this mean for Squalus acanthias as a species? At the very least, Verissimo et al. (2010) suggest that north Pacific dogfish should be considered a separate stock for the purpose of fisheries management, an suggestion backed up by the slower growth and higher age at maturity for that population. What is currently unclear is whether the north Pacific population has been reproductively isolated from the rest of the Squalus acanthias world long enough to be considered a totally different species. When first described, spiny dogfish from the north Pacific actually were considered a different species and given the scientific name Squalus suckleyi before eventually being lumped in with Squalus acanthias. Is it time to resurrect Squalus suckleyi as a species? Then again, Verissimo et al. (2010) also found some evidence that north Pacific dogfish may have been the original spiny dogfish (that’s where the title of this post comes in). From what they’ve managed to reconstruct, it looks like the Squalus acanthias that we know and love today originally evolved in the north Pacific before radiating out to the rest of the Pacific and eventually making their way around South America and into the Atlantic. Does this mean that the life history characteristics we see in spiny dogfish in Puget Sound are the ancestral characteristics of the species, or the result of genetic isolation? Also, a lot of what is currently understood about Squalus acanthias is from the study of sharks that may actually have been Squalus suckleyi this whole time, which will likely cause a lot of facepalming among dogfish researchers. To steal a phrase the Southern Fried Scientist, evolution is a weird and wonderful thing. I guess you’ve got your work cut out for you: get a few of each and try to breed them! If you can get fertile offspring, it’s one species, right? Even if it’s done through artificial insemination, I think. One can only hope that the end result is super dogfish that grow to six feet in length and can fly. They don’t already do that? I’ve been grossly misinformed! Nah, the normal ones just breathe fire. Pingback: Ocean of Pseudoscience: “Voracious Beyond Belief” | Ya Like Dags? See also Ebert et al. 2010. Resurrection and redescription of Squalus suckleyi (Girarg, 1854) from the North Pacific, with comments on the Squalus acanthias subgroup (Squaliformes: Squalidae). Zootaxa 2612: 22-40. This paper adds comparisons ofmeristic, morphological, and molecular data. 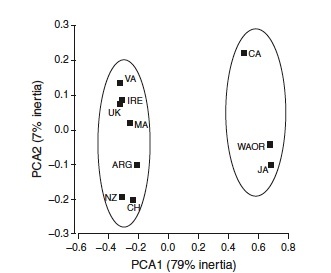 Their genetic comparisons were consistent with Verrisimo et al. 2010.